Download Torrents, videos and share media with your browser. To access and surf Internet, it can be only done with browsers. So the very best way to use the browser is by optimizing it in such a way that, it can get everything you need to do. It all depends on how powerful is your browser when it comes to multitasking and increase your productivity when you are online. Related Post: Top 10 Google Chrome Extensions For Better Surfing. 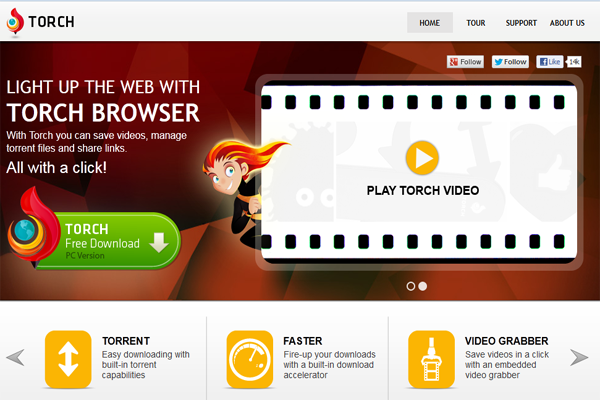 Torch is one of the powerful browser which I experienced recently while using. This browser is based with Chromium code which make it safe and secure to use. This Chromium technology is Opensource introduced by Google Chrome OS. So Torch browser includes all the functionality of Google Chrome with its additional built-in features. Download Torrent: Yes, you got it right! With this browser you can download Torrents directly to your computer without any third-party application or any extension added to the browser. You can easily monitor the seeds as you do in any other torrent application. No additional software to be installed on the computer, you can directly run all your Torrents in browser itself. Social Sharing: This browser gives a direct option to share things on Internet with one Click experience. You can share media on Facebook with one click as it shows the social sharing button added on the address bar. Video Downloader: You may have often felt handicapped when have to download videos from any online media. To overcome this challenge another button is placed on address bar, which downloads all your online video by just clicking on it when video is running in the browser. Download Accelerator: When you download any file from Internet, you want it to get downloaded faster. Many of you may be using downloading accelerators to boost up your downloading experience. But in Torch browser, it automatically optimizes the speed of your download. Related Post: Free calling for 30mins daily, PC to mobile phones! Safe and Secure: since Torch browser is powered up by Chromium OS, the safety is very well-kept in notice for its users. If it detects any malicious or virus activity on the web pages, it notifies it to the user. It stores password when you allow, but will not share the password. I have used this browser and I feel it’s a good pick if you prefer to stay online most of the time. If you are addicted to Google Chrome it is very similar to it, but with many additional options for its users. Get a powerful browsing experience by downloading Torch Browser. Is there a chance you wrote that review after my comments on your uTorrent review?! Off course Yes! I value my readers and their suggestions with new ideas. Ping me if you find something like this. Stay tuned much more to come. « Top 5 Youtube tricks you should know.